Pssst. Hey. Taco Bell. It’s your boy E. Ya, ya. The one who frequents you quite often after a night of boozing or self-loathing. Normally, I love your crazy concoctions. Doritos-flavored tacos? Brilliant. Fritos chips jammed in a burrito? Wonderful. But this is too far friend. Pop Rocks are barely edible on their own. They have no business inside my fourth meal. 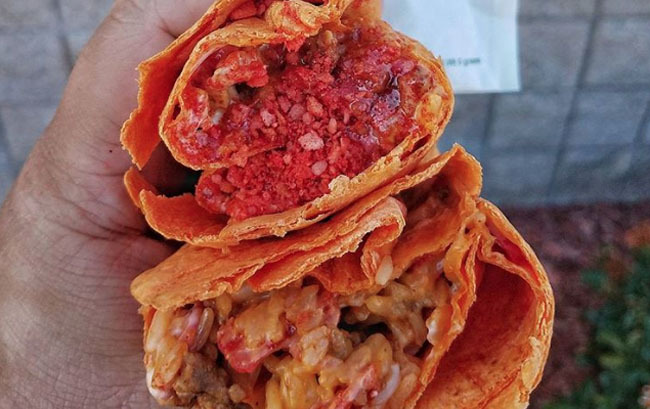 Taco Bell has released a limited-time item in four California locations known as the Firecracker burrito. It’s your standard burrito: rice, cheese, beef, and red tortilla strips. Except for one item. Pop Rocks. What does the Firecracker Burrito taste like? Tortilla was red, looked like it had been marinated at some point or maybe they come that way. It was late, the location didnt even say it was open, and the item was on a lawn sign and not on the menu itself so i just ordered it. There was also a spicy version which apparently “only” adds chipotle sauce that i don’t recall ever trying. Mine was the cheesy type so it had i assume nacho cheese, beef, lots of rice, some red strips, and a packet of these “poppers” which taste sweet and crackle just like pop rocks. I appreciate the creativity. I do. But this one feels like a swing and a miss. The limited time item is only available until Aug. 16 at four Taco Bell locations in Anaheim, Santa Ana, and Tustin, California.